In this post, I’ll show a job listing for an equity analyst position from a Philippine based stockbrokerage firm, and let’s see what traits the company is looking for. Because I’ve passed all three levels of the Chartered Financial Analyst (CFA) exams, I would normally get emails regarding job opportunities in investment. Do you have what it takes? 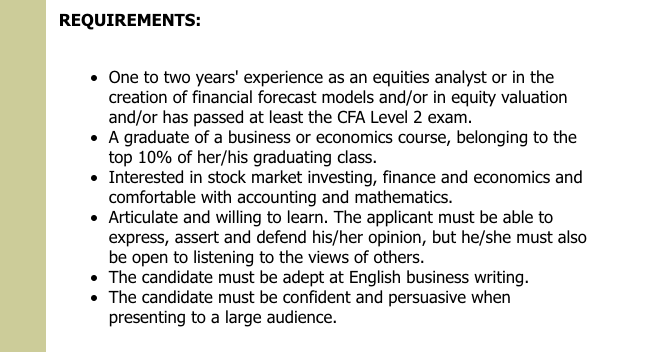 Requirements for an equity analyst job at a stock brokerage firm Philippines. Image captured from job listing email. I think I have what they are looking for. I enjoy working as a doctor though. What caught my eye in the list is the requirement for being “persuasive”. I always thought that if you’re an equity analyst, your work should speak for itself. I didn’t know that part of the job is to also “convince” people. Ok, I am convinced. The author really knows how to persuade.